Personal Injury Attorneys Miami Law Firm | Shamis & Gentile, P.A. In this article the Personal Injury Attorneys Miami Law Firm, Shamis and Gentile, P.A. discuss the dangers of driving on Florida’s interstates. Florida has some of the busiest interstates in the country, which increases the need for caution while traveling and driving. 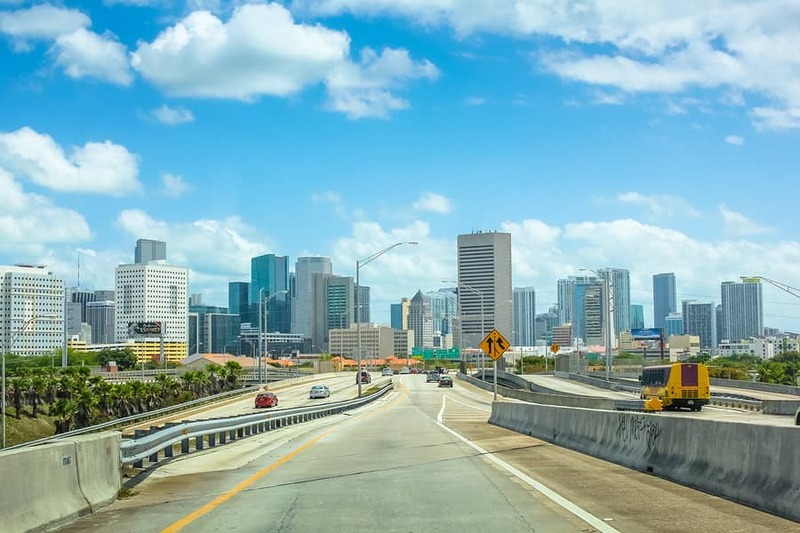 According to a recent study by EverQuote, you should be extra careful if driving on I-4 because it has received the unfortunate title of being the most dangerous interstate in America. While interstate travel has become more dangerous nationwide, I-4 has frightening mortality rate of 1.41 deaths per mile during the last six years over its 132 mile stretch from Tampa to Daytona Beach. The overall increase in accidents is related to more driver being distracted, especially by cellphone use. Studies have shown that 61 percent of driver will user their phones while driving. However, I-4 isn’t alone in this category. Florida has three other major highways high on the list that might make you want to consider the backroads. The Florida Turnpike runs through 11 counties and is famous for fast drivers, road debris, and vacationers that make driving perilous. Daytime driving is recommended as the safest bet on the turnpike. Interstate 95 is known to be particularly dangerous stretching from Miami-Dade through Broward County. This portion of the interstate experiences a mortality rate of 1.73 deaths per mile, again, often caused by distracted drivers. The other major contributor here is congestion, with 300,000 vehicles often traveling this busy interstate daily. It is not uncommon for 60 percent of I-95 to experience congestion on a regular basis. How Dangerous is I-75 for Truck Accidents? According to the last available statistics, from 2011 to 2015, the number of truck-related accidents on I-75 nearly doubled from 171 to 331. There are more than 10,000 trucks that enter and leave Florida every day on I-75. There were 4,050 fatal crashes involving large trucks in 2015, the highest number since 2008, according to federal data. How Dangerous is I-95 for Truck Accidents? Why are Florida Interstates so Likely to Have Car Accidents and other automobile accidents? With Florida’s growing population there has been an increase in truck accidents once again despite a lull in numbers due to increased safety precautions implemented in the late 2000’s. The statistics speak for themselves in regard to the danger awaiting commercial vehicles and those traveling beside them on Florida’s interstates. With congestion comes stress which is a primary contributor to aggressive driving. People have places to be and nothing can frustrate a driver like bumper to bumper traffic at rush hour and all it takes is one turn into the wrong lane at the wrong time for a terrible accident to occur. At any point of time there is always some form of construction going on somewhere on one of Florida’s interstates. Sometimes this can directly cause accidents with things like the aforementioned smoke fog. Roadside construction work contributes towards accident risk through lane closures and traffic slowing leading to stressed drivers and conditions dangerous for inattentive drivers who may fail to notice eager drivers wanting to maneuver through congested roads around construction sites. In order to help keep Florida’s interstates as safe as possible and decrease your risk of contributing to a truck accident follow these tips. When driving, do not get distracted by things like your smartphone, and give the highway your undivided attention. Stop to get up and stretch every couple hours and avoid sleepy driving. Drive at the posted speed limit in optimal conditions, and change your speed when the going gets rough. Factors like snow, ice and rain, as well as construction and dense traffic, are all indicators that you may need to slow down. On many highways, the left lane is considered the passing lane, so if you are not overtaking a slower-moving vehicle, stay in the right lane. Turn on your headlights when the sun begins to set or whenever you use your windshield wipers, and make sure that your windshield, windows and all exterior lights are clean. Nobody likes being tailgated, and if the driver in front of you has to come to a quick stop, following too closely could result in an accident. Personal Injury Attorneys Miami Law Firm Shamis & Gentile, P.A. If you or a loved one have been affected by the tragedy of a commercial vehicle collision like the ones described please reach out to South Florida Injury Attorneys to help consider your options for legal action. The Personal Injury Attorneys Miami Law Firm, Shamis & Gentile, P.A. have extensive experience in successfully helping those affected by tragedies such as this to receive the compensation they deserve. Contact The Personal Injury Attorneys Miami Law Firm Shamis & Gentile, P.A. Please feel free to contact the Personal Injury Attorneys Miami Law Firm, South Florida Injury Attorney’s P.A. with any questions. You can reach us by email info@shamisgentile.com or by phone 305-479-2299. The personal injury attorneys Miami law firm, Shamis & Gentile, P.A. are here to help you recover and get the compensation you deserve. Can IVC Filters Be Dangerous?